In our experiments, we examined high light responses and photosynthetic capacity of chlorophyll-less isogenic mutant lines of hexaploid bread wheat (Triticum aestivum L.) and tetraploid durum wheat (Triticum durum L.) in comparison to parental lines representing the wild type (WT), in two growth phases and two environments. In young plants, we observed a typical yellow-green phenotype with low chlorophyll content, significantly lower CO2 assimilation rate, elevated chlorophyll a-to-b ratio and insufficient regulation of linear electron transport. In the mutants grown in a moderate light in the growth chamber, a typical “chlorina” phenotype almost disappeared or, at least, was significantly alleviated in later growth stages, including the values of CO2 assimilation and the majority of the measured parameters related to photoprotective responses. On the other hand, in the case of the mutant lines grown in direct sunlight and fluctuating environment, the chlorophyll-less phenotype was evident also in latter growth phases. The chlorophyll-less phenotype was more severe in the durum wheat mutant lines compared to the bread wheat. For example, the durum wheat mutant lines grown outdoors expressed lower flexibility of photoprotective responses, including lower non-photochemical quenching and low rate of cyclic electron flow compared to WT or bread wheat mutants. Based on the analyses, we have identified a set of parameters providing information on the specific photosynthetic traits typical for the chlorophyll-less phenotype. Thus, the proposed way of phenotyping may serve for efficient selection of mutant genotypes for future research or screening activities. 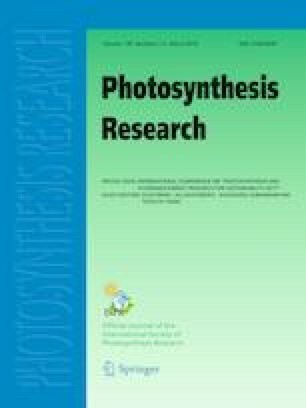 As a general result, we observed that the decrease of the chlorophyll content due to mutation was always associated with improper regulation of linear electron transport and a limited ability to prevent over-reduction of PSI acceptor side, regardless of the genotype, environment, and growth stage. This can partly explain why the low chlorophyll mutants were not successful in the evolution of higher plants, despite the photosynthetic capacity observed is high enough and they are fully competitive with wild-type plants in non-fluctuating controlled environment. Marek Zivcak and Marian Brestic have contributed equally to this work. This work was supported by the projects VEGA-1-0923-16, VEGA-1-0831-17, and APVV-15-0721. SIA was supported by grants from the Russian Foundation for Basic Research (No: 17-04-01289). We thank Prof. N. Watanabe, College of Agriculture, Ibaraki University, Inashiki, Japan, for providing the seeds of the mutants and their characteristics. We also thank our former colleague Kristina Kunderlikova for her participation in the measurements. MZ, MB, and SIA wrote the paper. MZ and LB conducted the statistical analyses and analyses of photosynthetic parameters. PH provided unique biological material and led the field experiments. MB, YCh, and SIA contributed to experimental design and interpretation of results, and helped to draft the manuscript. Neither the manuscript nor any part of its content has been published or submitted for publication elsewhere. All authors read and approved the final manuscript.